Heat 2 inches oil in a wide 5- to 6-quart heavy pot over high heat until it registers 380°F on thermometer. While oil is heating, whisk together flour and salt in a shallow bowl, then whisk in beer (batter will be thick). 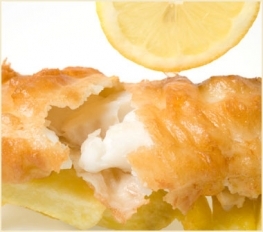 Coat each piece of fish with batter and transfer to hot oil with tongs (remove thermometer). Cook over high heat, turning over once, until golden and just cooked through, 5 to 6 minutes total, then transfer fish to paper towels to drain.